Damage Insulations for cables & bars. Fire & danger to life. 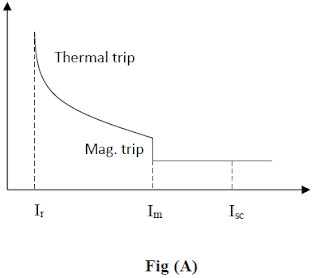 Electrodynamics forces result in deformation of bus bars & disconnect cables. Voltage Dip during the time. Dynamic instability and /or the loss of machine synchronization. So, the power systems should be designed to stand short circuit currents for a short period of time before the trip process takes place. Thermal trip: Responsible for protection against over load currents. Ir is normal breaker current that described as operation current. Im is a current that break trip become by magnetic part. Isc is a maximum short circuit current or maximum current that breaker can stand for a short trip time.